Home » Migrate to Australia » How to get Australia Skilled-Regional (Provisional) visa (subclass 489)? This entry was posted in Australia Australian Skilled Visas Migrate to Australia Study in Australia and tagged Australia skilled worker visa subclass 496 Australia Skilled-Regional visa Expression of Interest Study in Australia subclass 475 subclass 487 subclass 489 subclass 495 Work in Austalia on July 19, 2014 by Blog Author. Are you a skilled worker who wishes to work in Australia? You and your dependent family members can reside, study and work in the country for a maximum period of four years by obtaining Australia Skilled-Regional (Provisional) visa (subclass 489). The Invited Pathway and Extended Stay Pathway are the two ways through which one can obtain Australia Skilled-Regional (Provisional) visa. This visa lets you and your eligible family members to reside and travel in and out of Australia till the visa valid. Australia Skilled-Regional visa (subclass 489) holders can apply for Skilled-Regional (Residence) visa (subclass 887) which allows them to acquire permanent residency. The applicant must be selected by a state or territory government agency of Australia or sponsored by an eligible close relative residing in a designated region. If you are a skilled worker who holds a provisional skilled visa in subclass 496, 495, 487 or 475 for a minimum period of two years, you may be eligible to file an application under Extended Stay Pathway. To be invited for this visa, the applicants must score minimum 60 points in the points based test. The points will be scored based on certain factors such as educational qualifications, skilled employment, age, Australia study requirements, English language skills and other factors. The applicants need to score points specified in the letter of invitation to be eligible for Australia Skilled-Regional Visa (subclass 489). 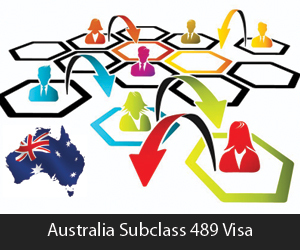 If you want to apply subclass 489 visa, fill out our Enquiry form, and also follow MoreVisas @ Facebook, Google+, Twitter.